Rhone Street Gardens: Happy 2011 Everyone! I hope everyone had a safe and happy New Year's Eve...and now on to 2011! Looking forward to this year, I have so many ideas and plans for the garden (and the house, of course). 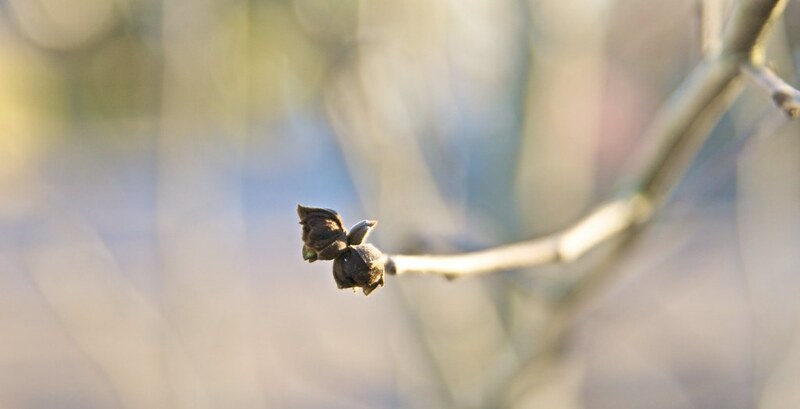 I'm looking forward to all your feedback and ideas, as I seem to be changing my mind every few days :-) As a kick-start to the year, above is a shot of a bud on my Persian Ironwood trees (Parrotia persica). We planted them a little over a year ago as part of the Friends of Trees program. I'd read they were related to Witch Hazels, and as such, bloom in winter (which I thought would be a nice bit of winter interest). So far, they have been lovely, with good summer form and beautiful fall color. I hadn't expected them to bloom for several years (until they had thoroughly settled in), but I noticed these odd, swollen buds a few weeks ago. They are different from the buds the leaves emerge from, so I can only speculate they might be flower buds! So, here's to 2011, I hope it is a good year for all, both in our gardens and life in general. Happy New Year to you too, Scott. Hoping your buds turn out to be much-hoped for flowers. Photos of buds are very moving to me - full of hope and expectancy. Looking forward to another photo when the bloom emerges! Happy 2011, I know your gardens are going to be spectacular. I've heard of this tree but don't know much about it. I hope you'll post a photo of the flower. May your all plans come off without a hitch in 2011! How exciting Scott. I hope that the new year treats you and all your plants most kindly! When you've figured out the secret to deciding and settling on garden plans... would you let me know? I've had that problem for years, and it gets worse with each passing season - too many ideas, and not enough time. Thanks so much, everyone...here's to another full year of blogging and gardening!!! Hi Scott, how cool that you have a Parrotia! Did you know I did one of the tree posting on it right before Christmas. I have a photo of the blooms.